The word ‘preservation’ often brings to mind old-growth forests and endangered species. But do we ever stop to think about the preservation of our own sense of self? The busy-ness of life can take its toll. We are all juggling responsibilities, commitments and relationships, and often the last on our list of priorities is ourselves. We may find it easy to help a friend in need, yet we often give ourselves the cold shoulder when we need nurturing the most. 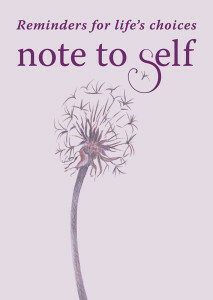 We may get caught up in self-defeating behaviour; criticising, blaming and resorting to harmful habits. This eventually leads to a damaged sense of self and we end up surviving rather than thriving. Preservation is about reminding ourselves that we matter. It’s about choosing to keep our own self safe and intact. Whatever we are going through, whether it is invited or unwanted, it is vital that we look after ourselves. Whatever our starting, point and even while we are in the midst of challenging transformation, we still have strengths and virtues that need to be protected and preserved. Attending to our own needs is not a selfish act. Knowing what our needs are and meeting them daily is how we can preserve our sense of self. Honouring ourselves doesn’t mean that we matter more than others; but it does recognise that we can care for others far more effectively when we make it a priority to care for ourselves. The expectations we place on ourselves and others can have a major impact on our quality of life, our wellbeing and our relationships. Being honest with ourselves about what we expect is essential if we are to preserve our sense of self. I’m in control of my wellbeing. 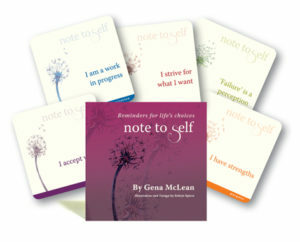 Note to Self is a card set containing reminders for life’s choices, and contains a suit of cards on the subject of preservation.